FOXBORO -- Wes Rockett watched from afar as his older brother Owen won a Super Bowl with St. John's Prep in 2012. On Saturday night, he made sure the Eagles and his family added one more. 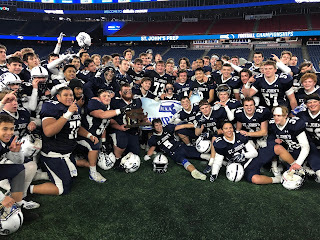 Rockett reeled in nine catches for 188 yards and three touchdowns while also adding an interception as St. John's Prep defeated Catholic Memorial, 40-22, to win the Division 1 Super Bowl at Gillette Stadium. Its the fourth Super Bowl in Prep program history and the first for Brian St. Pierre since he took over the program in 2014. "You dream about this forever, I watched my brother do it in 2012," Rockett said. "To do it at Gillette, where Tom Brady plays, every Sunday, its an incredible feeling. The guys rallied around each other." The combination of Rockett and running back Aise Pream (21 carries, 155 yards, two touchdowns) carried the Eagles offense all night long. Eagles quarterback Matt Crowley finished with 218 passing yards and three touchdowns. 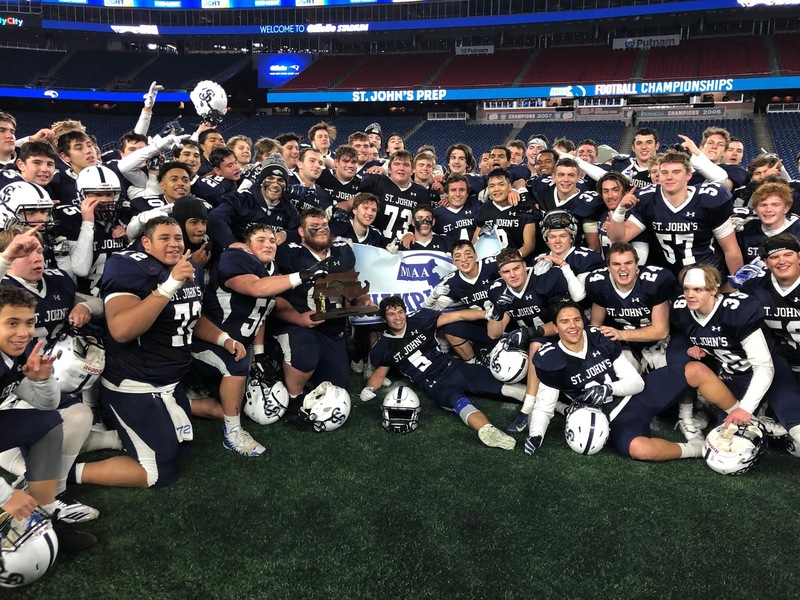 "The lead up to the game is way worse as a coach than as a player," St. John's Prep coach Brian St. Pierre, who won a Super Bowl as a quarterback for the Eagles, said. "I am just so happy for these guys. They came together as a group. Catholic Memorial is really talented and our guys just kept fighting." The pivotal moment of the game came late in the third quarter with Catholic Memorial on top, 22-19. On fourth down and one from their own 30-yard line, the Knights attempted a fake punt but Owen McGowan was short of the line to gain turning the ball back over to St. John's Prep. Three plays later, Crowley threw a deep ball to Rockett. The senior wide receiver maintained perfect concentration on the ball as it sliced through a pair of Knights defensive backs and into his hands for a 21-yard touchdown to give the Prep a 26-22 lead. "I don't wear my contacts all week during practice so then when I put them in game day, it makes it that much easier to see the ball," Rockett joked. "So I guess all my credit goes to my eye doctor who knows how to put them in for me." Early in the fourth quarter, the Knights had a chance to go in front with Barrett Pratt connecting with Brian Stubbs for a 30-yard completion out to their own 48-yard line. On the next play, however, Pratt was intercepted by Antael Rosa setting the Eagles up at their own 46-yard line. The Prep promptly grabbed some insurance with Pream picking up gains of 38 and nine yards before plunging into the end zone from four yards out to give the Eagles a 33-22 advantage with 5:22 remaining. "We scouted them, so we knew it was coming," St. Pierre said of the Knights fake punt. "He rolled the dice and we made them pay." Catholic Memorial fumbled on its first snap of its ensuing possession, and Crowley put the game out of reach with a 25-yard touchdown completion to Rockett - the senior's third of the night. "We're a banged up group and our guys just kept responding," said St. Pierre. "We got guys banged up all over the place and its a testament to our will and our fortitude. I couldn't be prouder." St. John's Prep grabbed a quick 16-0 edge. Pream got the Eagles on the board, 6-0, with a six-yard touchdown run midway through the first quarter and following a Knights punt, a 39-yard dash by the junior back set up a 35-yard field goal by Sean Majeski. Then, early in the second quarter, the Eagles increased their lead with Rockett hauling in a 52-yard touchdown reception to make it a 16-0 Prep advantage. "Wes is as good a receiver as we've had," St. Pierre said. "He cemented his legacy as the best player on the field tonight." Catholic Memorial was on its heels, but a pair of Prep turnovers allowed the Knights to claw their way back into the game before the half. First, Crowley was strip sacked by Lucas Folan resulting in a 23-yard touchdown pass from Pratt to Daniel Lopes to pull Catholic Memorial within 16-6. Moments later, it was Will Stockwell making things happen defensively as the Knights defensive back popped the ball free from Pream's hands and returned it to the Eagles 28-yard line. Two plays later, Pratt hit Owen McGowan for a 14-yard touchdown to pull the Knights within 16-14.